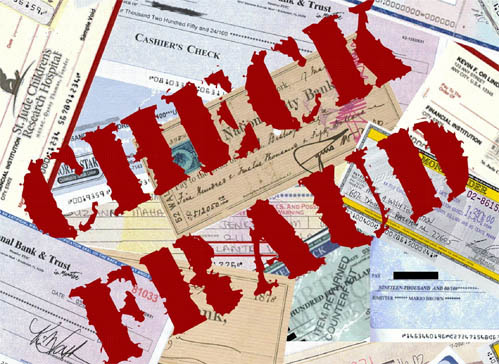 Fake check scams are clever ploys to steal your money and First Financial wants to make sure you know the ways you can avoid becoming a victim by simply recognizing how the scam process works. It is important that you understand that you are responsible for the checks you deposit to your account, even if they are fraudulent. So, if someone you don’t know wants to pay you by check but wants you to wire some of the money back, beware! It’s a scam that could cost YOU thousands of dollars. Fake check scammers hunt for victims. They scan newspaper and online advertisements for people listing items for sale, and check postings on online job sites from people seeking employment. Scammers place their own ads with phone numbers or email addresses for people to contact them and they call, send emails, or faxes to people randomly knowing that some will take the bait. They often claim to be in another country. The scammers say it’s too difficult and complicated to send you the money (i.e. they claim to be in the military or vacationing overseas) directly from their country, so they’ll arrange for someone in the U.S. to send you a check. You don’t have to wait long to use the money, but that doesn’t mean the check is good. Under federal law, banks and financial institutions have to make the funds you deposit available quickly – usually within one to five days, depending on the type of check. But just because you can withdraw the money doesn’t mean the check is good, even if it’s a cashier’s check. It can take weeks for the forgery to be discovered and the check to bounce.That means it might be a month or more before they take the money out of your account. You are responsible for the checks you deposit. That’s because you’re in the best position to determine the risk – you’re the one dealing directly with the person who is arranging for the check to be sent to you. When a check bounces, the bank or credit union deducts the amount that was originally credited to your account. If there isn’t enough to cover it, the bank or credit union may be able to take money from other accounts you have at that institution, or sue you to recover the funds. In some cases, law enforcement authorities could bring charges against the victims because it may look like they were involved in the scam and knew the check was counterfeit. There is no legitimate reason for someone who is giving you money to ask you to wire money back. If a stranger wants to pay you for something, insist on a cashier’s check for the exact amount, preferably from a local financial institution or a financial insitution that has a branch in your area. Don’t deposit it – report it! Report fake check scams immediately to NCL’s Fraud Center, at www.fraud.org. That information will be transmitted to the appropriate law enforcement agencies. Think this doesn’t happen close to home or at First Financial? Think again! Here is an example of an incident that occurred in one of our branches: We received an HSBC check from a member who stated that he received the check in the mail from a person claiming to need a personal assistant located near Russia. After further investigating the check, one of our tellers realized that the routing number did not have the required 9 digits – it had 10, and the check number on the bottom of the check did not match the check number in the top right corner. The teller went on to the HSBC website and discovered that there is not a financial institution located at the address printed on the check. The teller then contacted HSBC’s fraud department and spoke with a representative to confirm that the check was indeed fake. We then contacted the member to explain the situation and what was to follow. For video examples, visit FakeChecks.org a public education TV campaign and website that exposes six common cashier’s check scams: online seductions, over payments, renter schemes, fake lotteries, work-at-home scams, and foreign business partnerships. The site includes funny “Candid Camera” style videos of an actor getting members of the public to fall for fake check scams, and videos of real victims sharing their stories. If you suspect you’ve received a fraudulent check, please contact us at 732.312.1500 or stop into any one of our branches and have a representative look at the check to try to help you confirm its validity. We also encourage you to visit our Online Fraud Help & Internet Crime Prevention page on our website in order to protect yourself and/or your business from crime. **First Financial is not responsible for content listed on external websites. This entry was posted in Preventing Identity Theft and tagged Check fraud scams, Fake check scams by M2 The Agency. Bookmark the permalink.